Krishna grows from a child into a young man still craving forbidden fruit. One evening, enchanted by the nubile grace of the village milkmaids as they go about their work currying and milking the sacred cows, he picks up his flute and walks through the gloaming, pouring his yearning into the notes he plays. The music floats on the evening breeze, slides over garden walls, slips between shutters, drifts down the chimneys. His tender air piggybacks on the breath of every woman, permeating her lung’s alveoli, seeping into the corpuscles of her blood until each cell yearns toward his call. The chaste women of Braj leave their tasks unfinished. Buckets splash back into the well, brooms clatter to the ground; soft puffs of dust rise from beneath their pattering feet. Night falls, the moon rises, still his flute plays on. Women dance, circling round the god. Tightly wound saris unravel, floating on the breeze. Krishna multiplies himself sixteen thousand times, temporarily gratifying each woman’s desires. When dawn breaks, he disappears leaving them longing for the god. 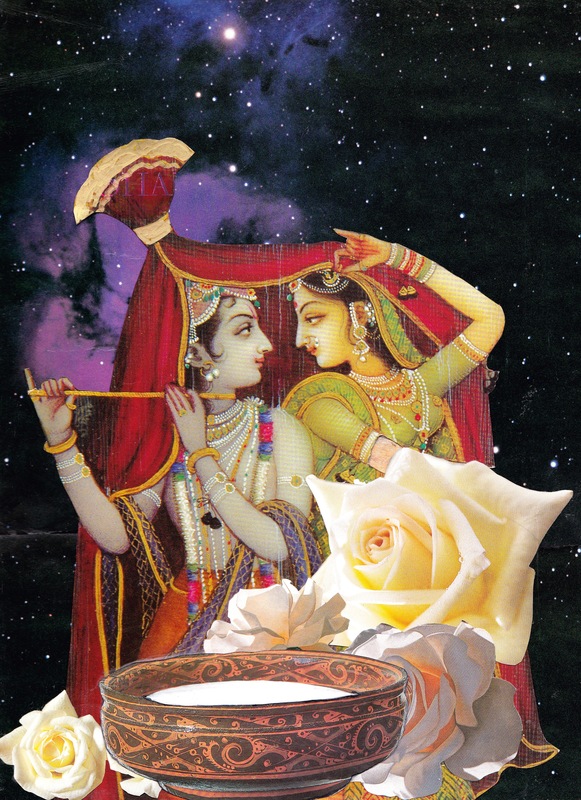 I think these stories say something about desire being the beginning of awakening (another word for arousal) Krishna stirs – he stirs up his mother, he stirs the dirt, he steals butter which comes from stirring milk, he stirs the milkmaids, he stirs the air, his own body stirs. He mixes things up, turns them on their head, confuses and enchants. Out of this great stirring comes desire. Desire heightens every sense – smell, touch, taste, sight, hearing all go into overdrive, become sensitive to nuance and swoon from a surfeit of delight. Consummation – the fulfillment of desire – consuming, having, obtaining, owning – is a completely different thing. Blissful as it may be, attaining is not as delight-full as wanting because in getting the one thing we want, we shut down all the other potentialities. This is why Rumi and the other mystics of every religion stress the importance of longing as an attribute of devotion and prayer. Stay in the place of desire and everything you see belongs to you. Pluck the peach, consume it and your hunger is gone. Plums, apricots, pears and pomegranates, all so enticing moments ago, all so alive and delicious to the imagination, lose their appeal. That’s not to say we shouldn’t eat or make love – just, when we are blessed with ineffable yearning, we should take the time to revel in it and linger awhile in that place of infinite possibility. The longing Krishna evokes is inchoate – it has no actual object because as soon as we make the god into an object he disappears. There are no instructions, no directions, just a longing which we can barely voice and then only in metaphor. The gift lies in the disappearance, the nothingness, the void he leaves behind. Our questions: What is the gift in nothingness? From whence comes our awakening?